This is an eight hour seminar with the perfect combination of classroom training and hands-on On-The-Water training. It provides explanation of how your boat handles and why. Film clips let you visualize the maneuvers prior to your experiencing them on the water. It covers use of lines, departing the dock, operating in a fairway, pivoting, mooring, backing, docking, steering - slalom, holding course - range, and a quick stop. 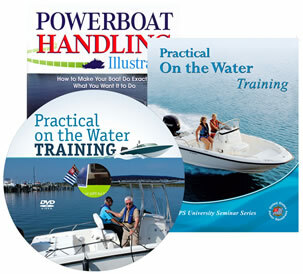 Each student receives a copy of Powerboat Handling Illustrated, a DVD, a Student Manual, and a certificate acknowledging his/her training.